2 months ago we were giveaway 2 Free Daniusoft Video Converter Pro license for Windows users, I believe Apple Mac users must be interested on any Free converter giveaway. Last night when I surf the web, I found a Free video converter for Mac users, so I decided to share it with you today. This special giveaway is organized by Digiarty Software. “WinX HD Video Converter for Mac, as a professional Mac HD converter software, provides the perfect solution to convert Blu-ray videos and videos from HDTV and HD camcorders, like JVC, Panasonic, Sony and Cannon to other formats. 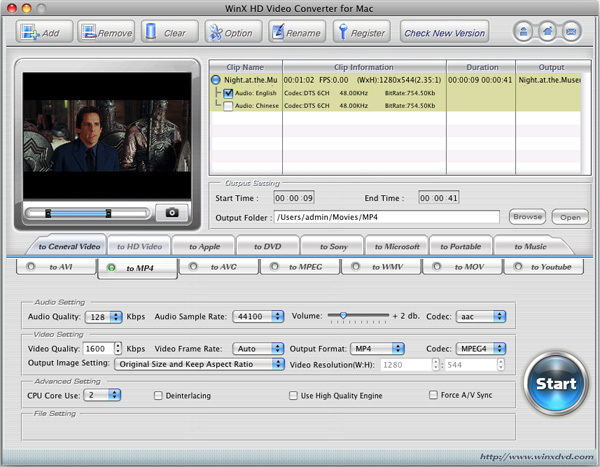 This HD converter for Mac supports converting Multi-track HD video M2TS, MKV, AVCHD, HDTV BDAV and MPEG-TS video movies. This WinX HD Video Converter for Mac is cost USD $ 39.95 (~ RM 130), but now they are giving it for Free until 8am 1st July 2010, and now you have few days to get it before you regret. Follow this link to download your Free Copy, then apply the license code WINXMC-2010-3721-GIVEAWAY during installation. This entry was posted in Free Stuff and tagged Digiarty, Free Video Converter, Giveaway, Mac, WinXDVD on June 28, 2010 by RMvalues.